Happy #footwearfriday fellow shoe lovers. We thought we'd end the week with a bang by highlighting more from one of our favorite British shoe designers. 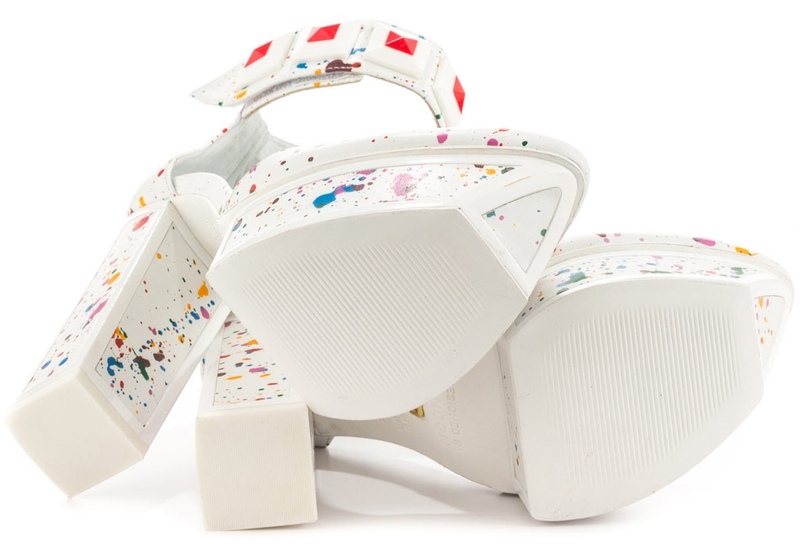 Feast your eyes on these printed leather Kat Maconie Colette Platform Sandals. The eye-catching women's platform features multicolored paint splatters on a crisp white leather upper, red and white pyramid studs embellishments around the ankle, almond toe, and a towering 5 1/2" metal-framed, block heel with 1 1/2" platform. We love the edginess and coolness factor on this mod-inspired platform. Grab this beauty for $284.99 at www.heels.com or www.solestruck.com.